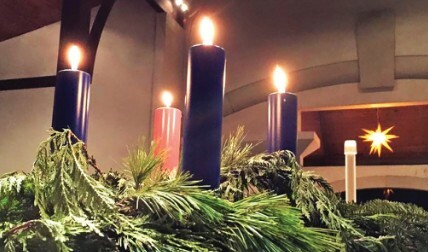 Lessons and Carols: Dec. 2 at 6 p.m.
We celebrate the Advent season with Advent Lessons and Carols. This beautiful annual event includes readings, hymns, anthems, and prayers that mark events in the story of Redemption. Join our Church Choir, Chorus, Choristers and Junior Choristers as we fill our nave in sound! A potluck Open House will immediately follow Lessons and Carols in the parish hall. All are invited to bring a savory or sweet finger food to share. (Please bring food items already plated and ready to share, so that there will be a minimum of set-up and clean-up). Service of the Word Thursday, November 22, 10:30 a.m. The service will include traditional Thanksgiving hymns, a sermon, and a Litany of Thanksgiving. All are welcome. Casual attire is encouraged. Dinner at Christ the King Church, 11:45 a.m.
Grandma comes to the parish hall – and you don’t even have to drive “over the river and through the woods”– for Thanksgiving Dinner! Paul and Marie Monroe have graciously volunteered to prepare turkey & dressing for a family-style Thanksgiving Day dinner in the parish hall. Any students who aren’t going home, young adults without plans, and all adults without family in town are invited to join them. If you would like, you may bring a covered dish to share (salad, vegetable, bread, dessert, fancy drinks, etc.). For an accurate count, please notify Beverly Davis. However, if you don’t sign up, you are still welcome: everyone will eat their fill and we’ll have baskets of food left over. Thanksgiving dinner will begin around 11:45 a.m. and run until the turkey tryptophan kicks in. Join us for the Blessing of the Animals service in the courtyard of Christ the King Church on Saturday, October 6 at 11:00 a.m. The congregation and the community at large are invited to bring any and all of their pets and have them blessed so God may “fulfill in you the purpose for which you were created” (from the rite of blessing). Pet treat and human snacks will be available following the 45 minute service. Lenten Vespers Wednesdays 7:00 p.m. The Wednesday Lenten Vespers service will be at 7:00 p.m. in the nave, February 21 and 28, and March 7, 14, and 21. Join us for meditations on the “I am” statements of Jesus from the Gospel of John. Hearkening back to the revelation of God’s name to Moses at the site of the burning bush as “I am who I am” – or, “I will be who I am” (Exodus 3:14), Jesus uses a series of “I AM” statements to describe himself. The images he uses invite us to reflect who Jesus is for the church, the world, and us. The congregation is invited to make Jesus’ sayings in the Gospel of John “I am the bread of life, the light of the world, the gate, the good shepherd” and so on the theme for this year’s Lenten devotions. A devotional book you are the way with daily readings, reflections and prayers is available at church for a small donation of $2 or can be purchased electronically at Augsburg Fortress. February 14-17 I am the way, and the truth, and the life. February 18-24 I am the gate; I am the good shepherd. February 25-March 3 I am the light of the world. March 4-10 I am the true vine; I am the vine, you are the branches. March 18-24 I am the bread of life. March 25-31 I am the resurrection and the life. All are invited to Friday Morning Bible Study. We gather after 10:00 a.m. for snacks and fellowship in the 2nd floor council room. Bible Study and prayer begin at 10:30, and we finish approximately 11:40 a.m.
Friday Morning Bible Study is an opportunity to enrich life in preparation for the Sunday assemblies. We read the texts assigned for the Sunday liturgy and prepare ourselves for the encounter with the living Lord who promises to be with us in word and sacrament.